(Mississauga, ON) This past summer, the Raptors 905 announced that the organization had named Charles Kissi as an Assistant Coach for the 2018-2019 season. 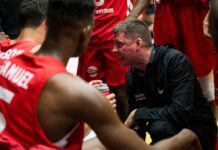 Over the course of the past five seasons, Kissi transformed Brock University’s men’s basketball team into one of the top programs in the country. The Brock Badgers posted a 21-3 record last season, a constant progression year-over-year from a four-win rebuilding season in Kissi’s first season with the team. 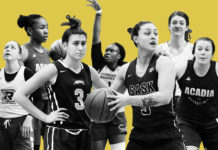 The Badgers have since reached the OUA Final Four in the past two seasons and competed in the U Sports Basketball Final 8 Championships in 2018 for the first time in 10 years. 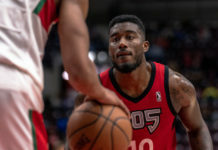 Kissi’s relationship with the Raptors is also well-documented, after being selected from the Raptors Coaches Open House event that started in 2011 to take part in a mentorship program with the team and then-Raptors head coach Dwane Casey for the 2012-2013 season. 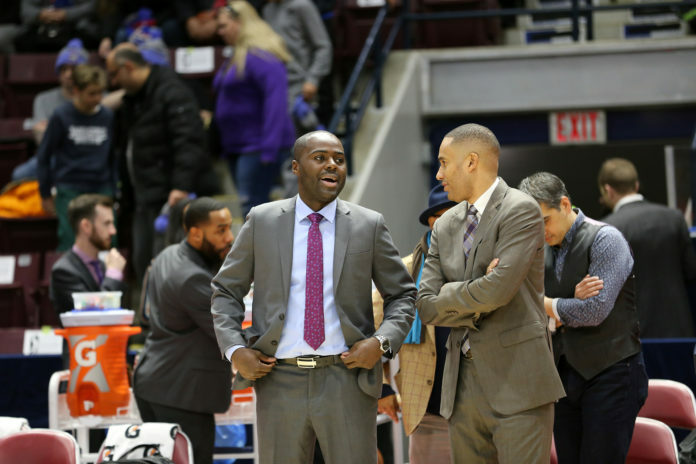 Now in the midst of his year off from coaching the Badgers, this past Sunday’s Raptors 905 matchup against Erie BayHawks marked the halfway point of the season. 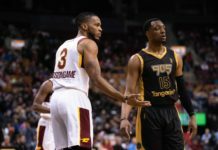 On Point Basketball caught up with Kissi after the game to see how the year has been so far. This interview has been edited and condensed for clarity. This is game 25, halfway through the season. How have you found this experience so far? What’s been the biggest difference for you? There’s lots of differences (laughs). It’s just a professional league, it’s a different league with a lot of resources, high-level players, I mean there’s a lot of high-level players in [U Sports] too but it’s just different. These guys are on the verge of playing in the NBA. There’s more pressure from night-to-night, I think. Travel, more games, it’s just more. It’s just more and it’s different, but it’s good in a different way. Are there any similarities in terms of your approach and your mindset? It’s basketball, you just try to be as prepared as possible. 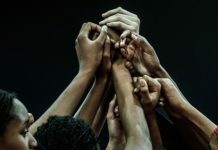 You try to build relationships like you would in the other [league], you try to drive and push your players to be better every day like you would anywhere. I think there’s a lot of common denominators no matter what level you’re coaching at. And my approach is the same, I think I just continue to be prepared for every game. I know that teaching and mentorship are a big part of what you value as a coach. 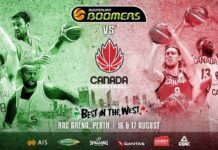 Now that you’re working day-to-day with guys like Jordan Loyd and Chris Boucher, who are 25 and 26 years old, and have had unique journeys and road blocks that they’ve been through. Does that help you when you look at the younger guys you’ve coached in terms of how you look to to approach mentoring them? 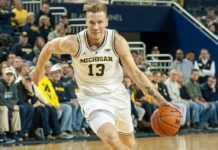 I think I take the same approach, because our guys had road blocks, and you know, issues and challenges and highs and lows just like these guys. Other than giving me more experience at this craft I think that ultimately you kind of approach it the same, you try to help these young men grow, develop, and achieve goals, and it’s the same idea, just a different place. You attended the Brock versus Ryerson game at the Meridian Centre back in November, this time not as a coach. What was that experience like for you to see everything that you’ve helped build? Cool. That’s what it’s about. I always say, my job was to build it and leave it better than I found it. And I think just with the Meridian Centre game, that’s a great example of that. It was so nice to be able to watch it and not coach it, to be honest. It was nice to be able to sit and watch a team play. You know, I was happy for those guys, I’m happy that the university kept it going and that we can continue to make it a strong part of the fabric of the university’s sporting. It was good, it was fun. 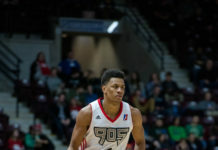 In terms of a U Sports connection, so far we’ve seen a couple of U Sports alumni play in the G League with Kaza Kajami-Keane and Aaron Best. 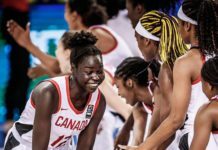 Now you’re a part of the coaching staff, Tamara Tatham (Assistant Coach with the Toronto Varsity Blues women’s basketball) is a mentor coach. 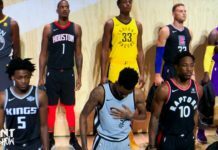 Do you see the G League becoming more of a path for future U Sport players and coaches, not just because the talent pool is increasing but also because they know that the 905 is paying attention and potentially looking to get them involved? I think it’s both ends, I think if you’re a U Sport coach or player, or anything, I think if you just sit back and wait for something to come to you, you’re crazy. I think you got to pursue it a little bit if you want it. I think there’s a lot of good coaches in the league that will probably never get the opportunity because they don’t want it. Or they’re not interested or that’s not for them. But those who are interested should try to pursue it and try to build relationships, and try to continue to work towards this if this is what they’re interested in. It’s the same for players, I think the doors are open, or they’ve been more open than they’ve ever been. And so it’s just a matter of people really working towards trying to make it happen. 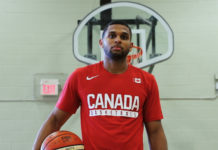 Speaking of Canadians and U Sports, yourself and Jama Mahlalela (who have known each other since high school and competed against each other). How fun of a full circle story is that for you both? A lot of fun. It’s a lot of fun, I get to coach with a good friend. It’s just a great situation, I always say I’m here for him, and I’m pretty fortunate to be in this situation. This was from the Raptors Coaches Open House (October 2012). If you look at the caption, it says, “Charles Kissi, Amateur Coach.” It’s only been about five years… Is there something small that you take pride in that you think has helped with your success? Something that you don’t talk a lot about? I work hard. I work really hard. When I was at Brock or wherever, I work really hard. And I think wherever I am, I’m trying to help that place be the best that it can be and it’s never about me. It’s always about bigger pictures, I just keep my mind open and just work. 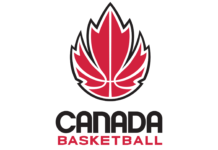 Trung Ho is a freelance basketball reporter, covering U Sports, Raptors 905 and Canada Basketball. You can follow him on Twitter @trungho.